OKLAHOMA BAPTIST UNIVERSITY is a small Christian liberal arts university in Shawnee, 30 minutes east of Oklahoma City. 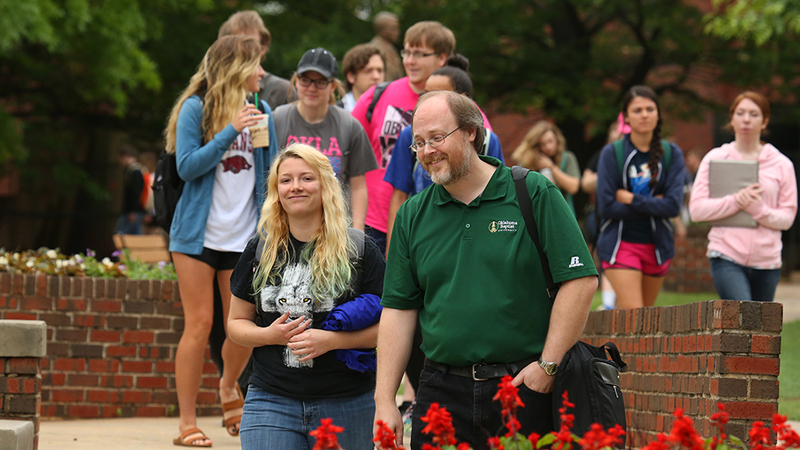 At OBU students learn how all knowledge connects and how that framework can be informed by a thoughtful Christian worldview. Students have the choice of 87 areas of study, the opportunity to work and study abroad and the chance to engage faculty mentors. All of this occurs in a supportive, Christian community; one that's dedicated to the highest intellectual and ethical standards. Jasmin Johnson and Martha Hernandez (Nursing) led a group of OBU nursing students to Port-au-Prince, Haiti, in order to participate in a nursing practicum in cooperation with the Fondation Pour Les Enfants D'Haiti. This trip was especially dramatic because of the demonstrations against the Haitian government. John Mouracade (Philosophy) experimented with a J-Term offering titled "Poverty and Social Justice." After engaging the topic academically on campus with the students, Dr. Mouracade then let them experience poverty and justice directly by taking them to Honduras, where the students worked along side the peasants of a small, isolated village to complete a local construction project. Laura Byland, David Byland, and Tom Doudy (Telecommunications, Theatre, and Sociology, respectively) once again led a group of OBU students to London to study telecommunications, theatre, and sociology. This biennial trip to London and its environs is always a favorite with the OBU students. Lee Goen (Business) led a group of business students who explored international business in both London and Paris during the January Term. President Mark and First Lady Rhonda Brister traveled to Urumqi, China, at the invitation of the President of Xinjiang University. They were there at the same time that Jim and Conchita Hansford (both Music) and a group of OBU students were teaching English with their University of Xinjiang English majors to Chinese youth. The Bristers were reciprocating a visit made by the President of Xinjiang University to Shawnee. Dale Griffin (Campus Minister) sponsored a group of students who spent time last summer working in Cambodia. Jackie Wilks (BCM Director) and Lucrecia Litherland (Languages) led separate groups to Guanajuato, Mexico. Mrs. Wilks worked with students who cooperated with Baptist missionaries in the Guanajuato region during January. Dr. Litherland supervised students who taught English to Mexican children and laid the foundation for future programs in that part of Mexico.